CHARLOTTE, N.C. -- Although Hurricane Matthew has been downgraded to Category 1 as it soaks the Carolinas, outage numbers are climbing and the potential for damage remains significant. The storm will continue to bring heavy rains and high winds to the Carolinas today before exiting on Sunday. 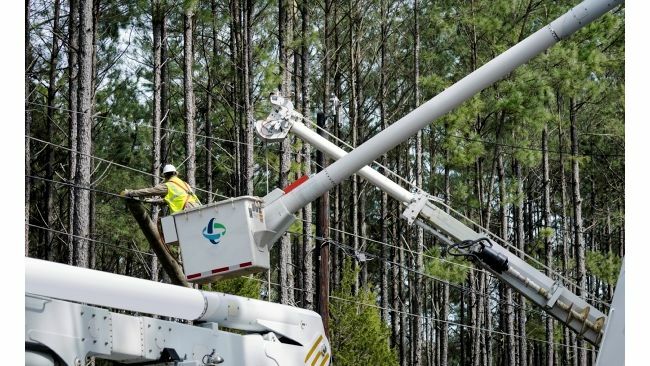 Duke Energy has continued to bolster its restoration army, now totaling about 5,600 line workers, tree crews, damage assessors and support people to respond to outages. "No matter how much we prepare, the destruction from this significant weather event can be extensive, resulting in power outages that may last a considerable amount of time," said Bobby Simpson, Duke Energy's storm director. "In some of the harder hit areas, we expect to have to rebuild portions of our system before we can restore power, and that takes time. "We ask our customers to stay safe and be patient," he added. "Tomorrow may be a bright, sunny day, but that won't erase the damage being done today." As soon as the storm passes and wind speeds drop below 39 miles per hour making it safe for travel, line crews will begin repairs. For safety reasons, Duke Energy line technicians cannot perform elevated work in bucket trucks when winds are above 30 miles per hour. Duke Energy's customer services has also supplemented its ranks to assist customers who call to report outages and emergencies. Customers can text OUT to 57801 to report an outage from their mobile phone. Be sure to use the mobile phone associated with the customer's account. Stay away from power lines that have fallen or are sagging. Consider all power lines energized, as well as trees or limbs in contact with power lines. Please report downed power lines to Duke Energy or your local power provider. If a power line falls across a car you're in, stay in the car. If you MUST get out of the car due to a fire or other immediate life-threatening situation, do your best to jump clear of the car and land on both feet. Be sure no part of your body is touching the car when your feet touch the ground. Power lines can be hidden by debris and standing water so please be extremely careful moving around in damaged areas. "Move Over and Slow Down" Law: The "move over" law requires drivers to move over one lane when two or more lanes are available in each direction to make way for emergency responders, tow trucks, DOT incident management assistance patrols and roadside work crews, such as utility crews. On roads with only one traffic lane in each direction, drivers must slow down and be prepared to stop. Violators could face fines. Families who have special medical needs or elderly members should closely monitor weather forecasts and make plans for potential alternate arrangements should an extended outage occur. Consider all downed lines energized and stay safely away. Use caution when walking outside as storm debris or standing water could conceal downed lines. Charge cell phones, computers and other electronic devices in advance of the storm to stay connected to important safety and response information. Stay Connected -- Duke Energy offers a number of ways for customers to get information about outages and restoration efforts. Duke Energy is the largest electric power holding company in the United States. Its regulated utility operations serve approximately 7.3 million electric customers located in six states in the Southeast and Midwest, representing a population of approximately 23 million people. It's Commercial Portfolio and International business segments own and operate diverse power generation assets in North America and Latin America, including a growing portfolio of renewable energy assets in the United States.